024. THE QUEST. Issued overseas by the British American Tobacco Co. Ltd. (B.A.T.) (1928). It is card number 48 from a set of 50 cards entitled "Ships and Shipping". The card was given as a free premium with the purchase of a pack of 10 cigarettes. Size: ? 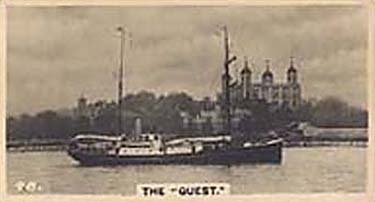 Recto: Black & white photograph of the "Quest" (Ernest Shackleton's Antarctic exploration vessel) passing the Tower of London on the Thames. No. 48 in white in lower left corner. Title at bottom: The "Quest."